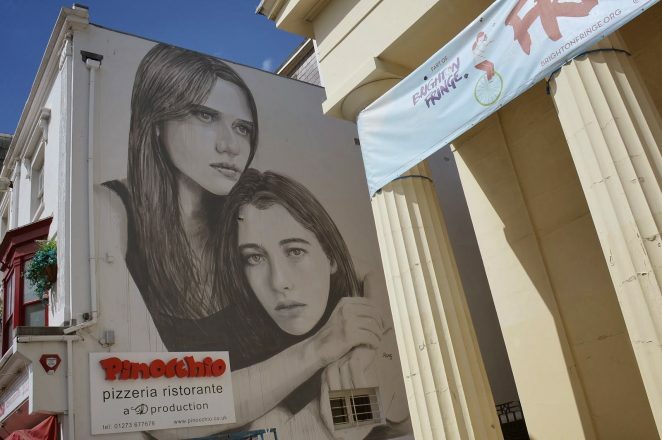 Acclaimed Australian artist Rone has just finished a startling depiction of two women on the side wall of Pinocchio restaurant in New Road, Brighton. The artwork is expertly produced but whether or not it improves the local environment is a matter of opinion. I am sure you will have your own ideas – but if you post them – please no rude remarks! Well, it looks okay, but they don’t seem very happy, do they? Hope it’s no reflection on the pizza! Actually, the style seems more French than Australian to me. Wonder what paint was used – hope it doesn’t run in the rain. It was fascinating to watch this painting coming together and the skill of the artist is unquestionable. What is its relevance? How permanent is it? Will more information be forthcoming?